The Air Niugini plane in the lagoon off Chuuk airport in Weno. An Air Niugini plane has sunk after ending up in a lagoon off Weno International Airport in the Federated States of Micronesia. 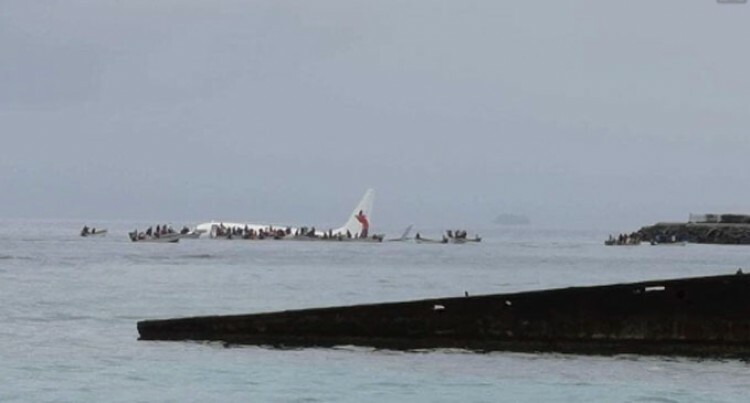 Photos emerging from Papua New Guinea and FSM show boats surrounding the partly submerged plane to rescue passengers. The Federal Aviation Administration’s Guam office confirmed that an Air Niugini plane crashed in waters in Chuuk state. It is understood that the place may have overshot Weno International Airport’s runway. There have been no confirmed reports of serious injury. It is understood that the Boeing 737-800 was scheduled to stop in Chuuk on its way from Pohnpei to Port Moresby.